We’ve been, unfortunately, delayed on site due to snow up here in Yorkshire over the Easter period. However, we have now finished the roof and internal walls ready for the first air pressure test, and are now waiting to install the Passivhaus-certified windows and doors, which we’re expecting this week. We’ve just taken delivery of some Compacfoam CF200 for the door thresholds. It is a wondrous material- structurally stable and can be machined and fixed like timber but has a lambda value of 0.046. It is an altered polystyrene, that has been transformed through heating I believe, and so is a lot stronger. This is going to be put under the thresholds of all the doors and bolted to the edge of the concrete floor slab which the doors can sit on. 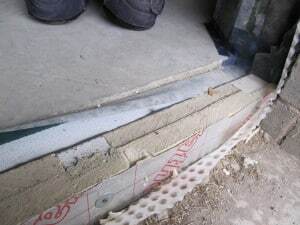 This gives us a robust foundation for the threshold but acts very well as a thermal break to minimise thermal bridging around the door/ floor junction. This is a development of what we did at Denby Dale (using a foam-filled fibreglass box) but is a lot quicker, easier and ultimately cheaper. 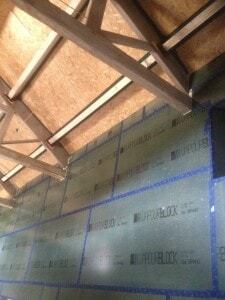 As described in a previous blog, we’re using 250mm fibreglass as the main insulation in our timber frame walls. Due to uncertainty *within the Passivhaus community around the airtightness of OSB boards we’ve decided to go for a more robust system, called Spano VapourBlock , screw fixed to the inner face of the timber wall. The Spano boards are more expensive than OSB but they provide more certainty regarding airtightness. The boards have then been taped with Tescon Vana tape at all joints. As we mention later in our blog on the roof, we have used OSB board on the sloping internal soffite (before we discovered Spano board). We could use an extra airtight membrane on the ceiling but I don’t want to go to the expense of that at the moment. I’m hoping that what we have at the moment will easily be adequate to pass the EnerPHit requirements for airtightness of 1 air change at 50 Pascals. 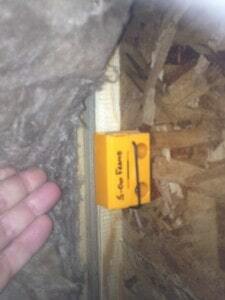 The Passivhaus community is having an ongoing debate about the airtightness of OSB board. It has been found to be not as consistent in airtightness as we’d thought even a couple of years ago. There have been buildings that have had to have an extra airtightness barrier to get down to Passivhaus levels. If your building has got to Passivhaus levels using OSB board – as ours did at Denby Dale – then good but the Passivhaus community is now expressing some concerns regarding its consistency of airtightness. For extra security and peace of mind we have decided to go for Spano board in our timber frame walls. As soon as we have installed the windows and doors, we’ll be able to have our first fit airtightness test. The Centre for the Built Environment at Leeds Beckett University will be kindly undertaking this for us and are also bringing along a thermal imaging camera which we’ll use to see air leakage particularly around the vulnerable areas, which will be the penetrations of the purlins and the trusses through our timber wall. So what we’ll do is heat up our inside space and de-pressurise so sucking in cooler air through any gaps that there are. The thermal imaging camera will then show where any air leakages are. This will saves us from having to use a scaffolding tower and going around each junction with a smoke gun – a useful method of testing air leakage on bigger buildings. There will, of course, need to be another airtightness test on the final build after all the services have been completed etc. Our friends at Leeds Beckett University have also installed moisture measuring probes (called HydroTrac sensors) at four points within the wall structure on both the south and north elevations of the barn. These will measure over time the moisture content of four points through the wall. There are three sensors within the timber wall and one in the cavity between the timber internal wall and the masonry external wall. The sensors are linked to a modem which links to a computer at Leeds Met for continuous readings. This research will be very valuable and will help inform the continuing debate about the ventilation of cavities and the dangers of solar driven moisture through masonry walls. We’ll obviously help share any of their findings and research.